Posted 9:44 am by Admin & filed under News. 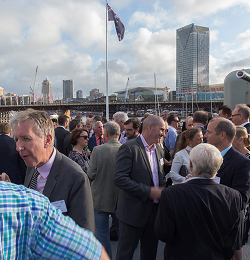 Marcus John (Director, Thomas Miller Australasia) was extremely happy with the turnout of over two hundred guests at the event on the retired Navy destroyer, representing the great and good of the Australian maritime, transport and insurance community. Among the Thomas Miller clients present were many Members of the TT Club and ITIC insurance mutuals, who have been served by the Sydney office throughout the past forty years – a wonderful symbol of the market’s enduring confidence in Thomas Miller’s Australasian businesses. The Sydney office has doubled in size over the last two years, with the addition of new teams for Thomas Miller Law and Thomas Miller Claims Management. Both of these young and expanding businesses were able to welcome and entertain many of their clients, writing a new chapter in Thomas Miller’s deep engagement with Australasia. The extended global family of Thomas Miller was represented by Bruce Kesterton, Charles Fenton, Stuart Munroe, Andrew Jones, Redvers Cunningham, Patrick Bond and Peter Jackson. Hosts and guests alike will now look forward to celebrating 50 Years, and to many more significant birthdays after that. Please click on the link below for the event write-up in Daily Cargo News (former Lloyds List Australasia), and some photos of the event.